You are currently browsing the category archive for the ‘thrift store friday’ category. I know it isn’t Friday, but I wanted to add another edition to my sadly neglected ‘Thrift Store Friday’ category which I have been pretty lazy in keeping going! Not that I haven’t been thrifting…I just haven’t been blogging my fab finds! Bad Winnie. 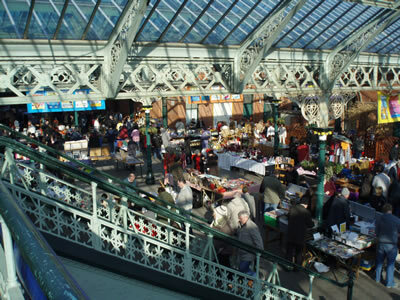 Here is the latest troll-a- thon…Tynemouth Market. 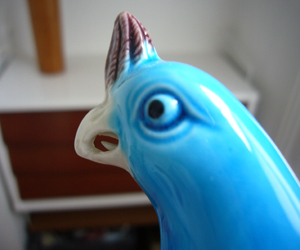 We were up in Newcastle last weekend for a group show and I was seriously disparing the lack of charity shop magic when on the last day – in the pouring rain- we decided to hit the antiques market at Tynemouth…and hit the jackpot. In a beautiful victorian train station, the market was shielded from the pouring rain. Then moved on to this delicate little pair of turquoise parrots. I saw them glowing from a distance and swooped in for the kill. Bubs is STILL mocking me for them, as he just doesn’t get their fabulousness. Poor, poor Bubby. Heh. 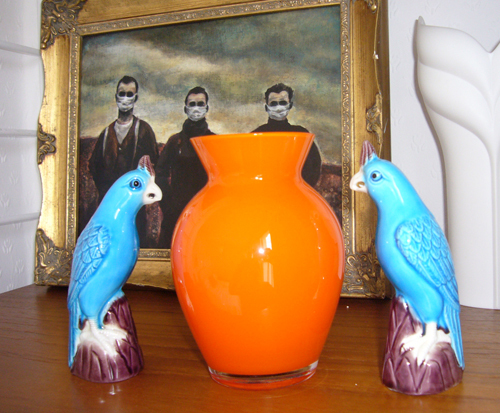 The cased orange vase was at a stall nearby. 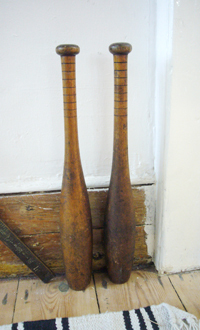 I also scored an amazing vintage wooden tripod. The before image was lost in a camera glitch, but I will be unveiling the transformation tomorrow. 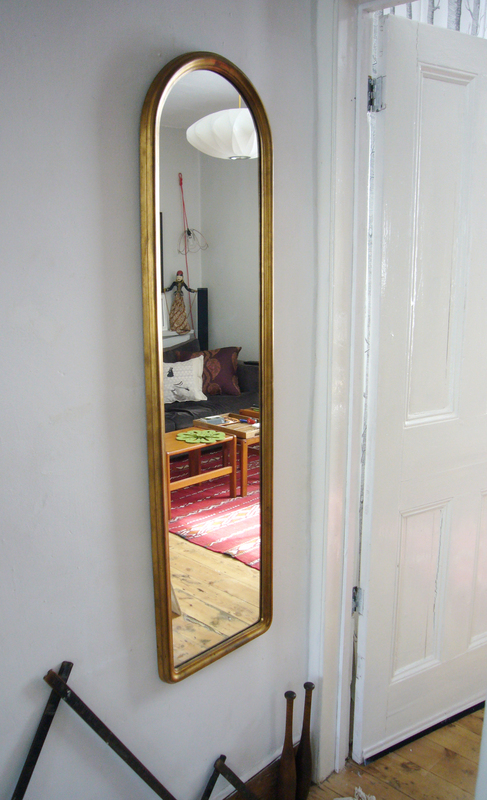 Lastly, but certainly not least, was this arched mirror. It is a little heavy, but I had my Sherpa (AKA Bubs) carry it for me most of the way, so it wasn’t too bad. All in all, the North was pretty damn good to me, don’t you think? Well, the intention to have this be a weekly post quickly fell through the cracks as life in the studio got busy, and my Friday secondhand shopping excursions got curtailed! I decided it had been much too long last week, though, and took a trek out to my favourite haunts. As usual my favourite Sally Ann did not disappoint! Below are my finds. 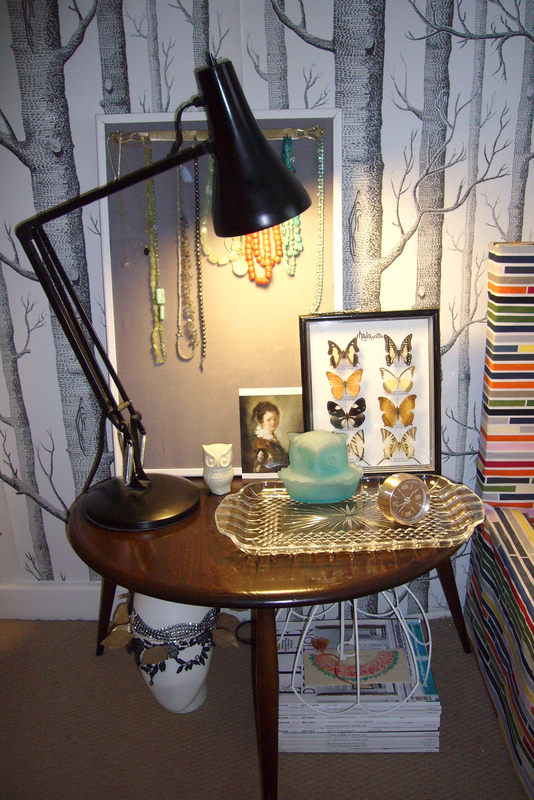 Here I am above with the crystal tray I picked up to protect my large Ercol table. (The varnish is really delicate, and any moisture promptly marks the surface! Must wax it or something.). I still don’t feel the tray is quite right. It is colourless and the right size but a little too fussy. I was hoping for something clear that is more modern and clean lined. However, the price was right and it will do for now and keep my darling table safe. The set of pebble tables were a fabulous gift from Bubby [the house elf], and are very precious to me! I picked up all the plates above for £1.50! 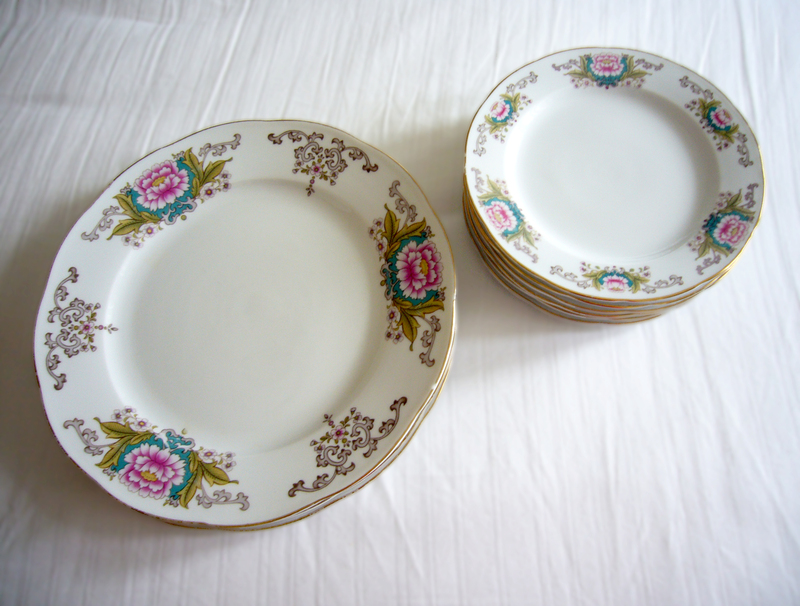 Perfect addition to my mixed pattern vintage set I have been accumulating. A fairly successful haul, all in all! Welcome to the second installation of my Friday celebration, heralding in the weekend with all good things secondhand! Though last week was a meagre week in my charity shop finds, I am counting it as successful, as I have now officially started my collection of ‘granny glass’ (see post regarding joys of glass candlesticks). 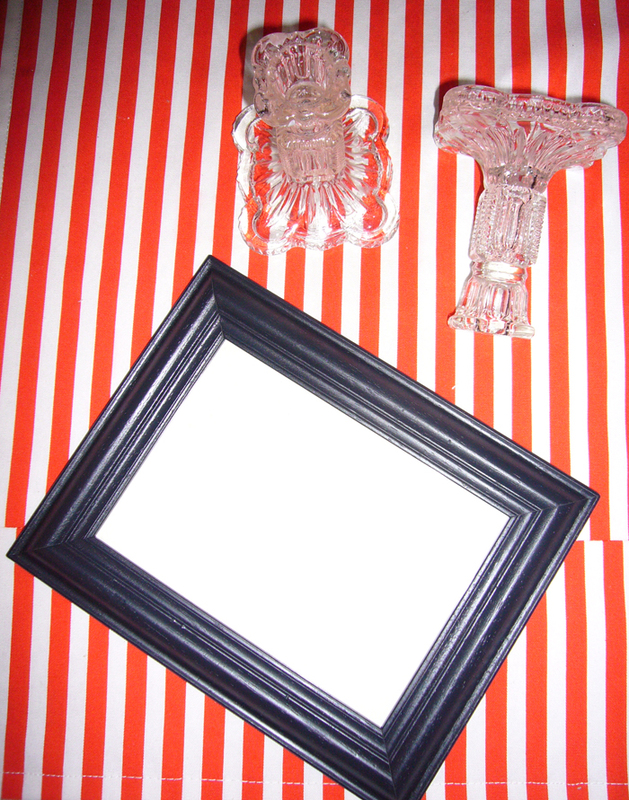 Here is my haul, such as it is – two vintage pressed glass candlesticks and a frame, shown already sprayed black, as I got ahead of myself and painted it before shooting the picture for this post! 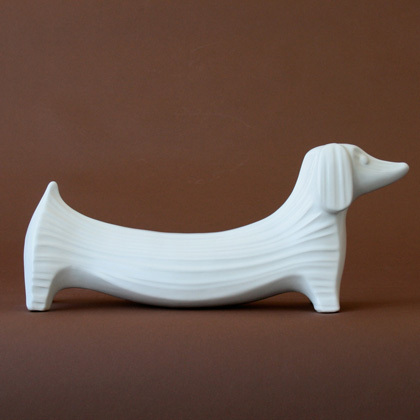 Since that photo seems so uninspired and lonely, I am including a picture of the weiner dog bought a few weeks back, now painted a sophisticated matte white (well, as sophisticated as this little puppy will get, anyway!). The ceramics on the box are salt and pepper shakers from Hornsea Pottery that I scored at my favorite shop a couple months ago, and a cheese dish and platter from Poole pottery, from their hand painted 1950s Freeform range, bought on Ebay. I have high hopes for this week’s treasure trolling, as we are heading to the coast, land of the popped clog and, therefore (hopefully), thrift store heaven! Wish me luck, and enjoy the weekend. I was going to call this new regular segment ‘Thrifty Fridays’ but it sounded too much like a nasty marketing pitch, so ‘Thrift Store Fridays’ was born. I realise that my Brit readers will likely ask “what is a thrift store?”…and for those lovely souls – just replace the word with charity and all will become clear. For the last few months, I have been taking Fridays off and they have become my own special day to hit the secondhand shops and hunt for vintage treasure before everyone swoops in on Saturday mornings. As I have regular requests from lovely friends to divulge my finds for the week, I figured it would be fun to post them as a regular weekly segment. 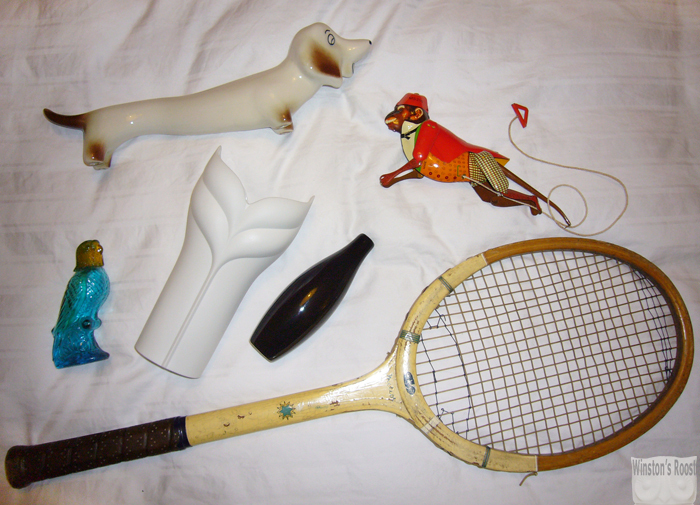 So here is last Friday’s score, with additions from the Battersea Car Boot Sale on Sunday. 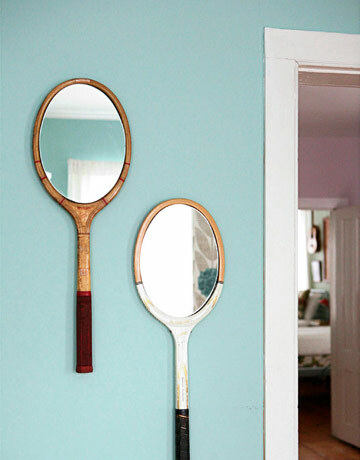 The vintage tennis racquet will be joining another antique racquet I have on an upcoming trip to the glaziers to get mirror cut for them and will become wall mirrors, like the ones below from Country Living magazine. 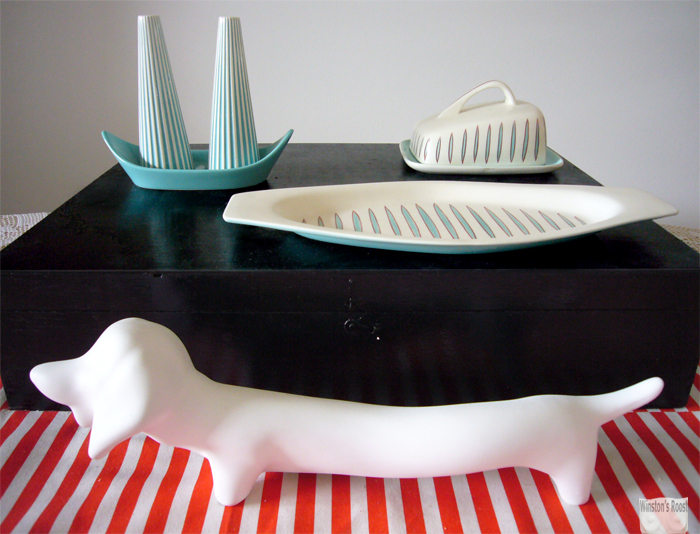 The extremely odd and admittedly gnomey weiner dog will get a coat of matte white spray paint to emulate the Jonathan Adler dachshund. I also got a slightly angled barrel lampshade that I have been seeking for months now for a teak lamp I picked up with the wrong shaped shade (Tulip shaped? With mid-century modern? What were they thinking?! ), but I have not included it in the shot, as it is in the DIY lab getting a transformation. I will be posting it soon, with one of my beloved ‘before and afters’. All in all, a fairly successful haul considering that most items were under £4, no? Happy hunting all. Have a good weekend.